Established since 2006, La Belle Couture Weddings is now one of Singapore’s leading bridal boutique that offers a full suite of bridal services, specialising in designer couture wedding gowns and professional wedding photography. We are also the only bridal boutique in Singapore to be awarded with the ISO 9001:2015 certificate, thus ensuring that your wedding day will be nothing short of perfect. Aside from having served more than 5000 happy couples, La Belle Couture is also widely acknowledged by notable influencers and celebrities, and have been featured in news & media for its belief to incorporate innovation into an unique experience like none other. La Belle Couture expands to include Wedding Planning & Wedding Styling services. In pursuit to fulfil our vision to provide a stress free experience to our couples while helping them to achieving their dream wedding, La Belle Couture Weddings & Rosette Designs & Co have combined and expanded our team to offer couples a complete suite of wedding services including Actual Day Wedding Planning & Wedding Styling. 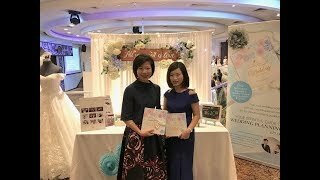 Rosette Designs & Co – a creative event design and planning company helmed by Hellen Lie, has built for themselves a reputation for creating weddings with a personal touch and being known for its commitment to making every wedding stress free and memorable for couples. It does this by personalising every event with elements which make a celebration more intimate and unforgettable. Listed as Top 10 Wedding Planners and Event Stylists in Singapore, Rosette Designs & Co offers couples a range of wedding services that serves their different needs. From conceptualising and creating wedding designs, building a cohesive style and look for your wedding, to coordinating your actual wedding day and seeing to all the deliverables and fine details, we deliver a holistic wedding experience for wedding couples. Click the below button to view more about our Wedding Planning & Styling services. SIGN UP. EARN POINTS. CASH IN. Good news! More savings coming your way – introducing our new Members Rewards Program! Planning a wedding can be stressful, especially when it’s burning a hole in your pocket! That’s why we are introducing our new Members Rewards Program that lets you earn $$$ back in rewards! There are so many ways that you can points that lets you redeem for cash! Simply Refer a Friend, Make A Purchase or Write Us A Review! For full details and to register for a free account, click the below button. Get awarded with 500 free points instantly upon registering for your account! Here’s how you can earn extra cash online! Refer a friend, or 2 or 3.. And each time you do, you earn points that lets you unlock CASH REWARDS! Earn up to $400 with just 2 successful referrals who signs up for a bridal package with La Belle Couture Weddings.If you genuinely wish for your friend to realise their dream wedding and experience a wonderful journey that they deserve, then start spreading the word about us! By joining the La Belle Couture Referral Program, you’ll receive 2 points for every $1 spent by your friend who was referred by you, and they’ll enjoy savings of up to $300 off bridal packages. It’s a win win. This program is open to all to join and it’s free. For full details and to register for a free account, click the below button. Get awarded with 500 free points instantly upon registering for your account! La Belle Couture launches 2017 new collection - 'Floraison' at Mandarin Oriental Singapore Hotel. Witness for yourself La Belle Couture’s latest Bridal & Evening collection of the year – ‘Floraison’ at Mandarin Oriental Singapore. With achingly beautiful silhouettes, the gowns from our latest collection are inspired by the vibrancy of flowers in full bloom and are adorned with gorgeous floral lace appliqué and beadwork that bring these dresses to a whole new level of gorgeous, resulting in the most enviable dresses. Click the button below to see more photos of the event. La Belle Couture launches 'Your Definitive Guide to Wedding Planning'. ‘Your Definitive Guide To Wedding Planning’ is a wedding 101 guidebook that allows brides and grooms to be to plan for their wedding effortlessly. Not only does it helps simplify the wedding planning process in the most cost effective manner, it also helps to shorten the time required for planning a wedding. A 3 year long effort by Peiru and her team, the book is officially launched by Senior Minister of State at the Ministries of Culture, Community and Youth and Trade and Industry, Ms Sim Ann on 22 April 2017 at Mandarin Orchard Singapore Hotel. ‘Your Definitive Guide To Wedding Planning’ is now retailing at Amazon, Kinokuniya & Times. You can also purchase the book at weddingprelude.com (key in the code WP20 and enjoy 20% off online price). Click the below button to buy your copy of ‘Your Definitive Guide To Wedding Planning’. You can also see the book being featured on Bridestory at https://goo.gl/qbfj1T. Marrying innovation and romance – watch how La Belle Couture revolutionise the way things are done and changed the bridal industry in a story on Game Changers, a 5 part series by Channel News Asia about business people who revolutionise the way things are done. Click the below button to see the full episode on Toggle or see the article at https://goo.gl/4Fcrxs. La Belle Couture's latest FX Mirror gets featured on The Straits Times. 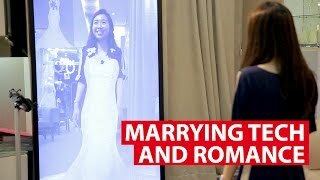 A strong believer on leveraging technology as a key business differentiator, La Belle Couture is currently the only retailer in Singapore to introduce the FX Mirror – a virtual fitting room that uses augmented reality technology where brides can try on more than 10 dresses in mere seconds and are able to discover what suit them best more efficiently. This latest technology uses Microsoft Kinect cameras and a 3-D virtual fitting software to analyse the shopper’s height and body shape, our bridal advisors and specialists are able to better recommend brides on which dresses fits them better based on their body analysis. Click the below button to see the full article by The Straits Times or visit our 'Media' page to see all media reports by major press such as Channel 8, Today, Berita Harian, 联合早报 & Spring Singapore on La Belle Couture’s Fx Mirror. Being the only bridal boutique in Singapore to be awarded with the ISO 9001:2015 certificate, you can be assured that every step of your journey with us will be handled with consistency and meticulousness without any hiccups. Being one of the keys to La Belle Couture’s ensuring success, our comprehensive workflow also guarantees a high level of professionalism, hence making sure that your wedding day will be nothing short of perfect. Click the below button to discover the La Belle experience. Why buy when you can rent? At Runway.Rent, we bring to you style and fashion to your doorstep effortlessly and affordably! Runway.Rent is the brainchild of Managing Director of La Belle Couture, Teo Peiru who recognises the increasing demand of woman who wants to be dressed up for special occasions like gala dinner, wedding dinner or even a special night out. Visit the website by clicking the button below.